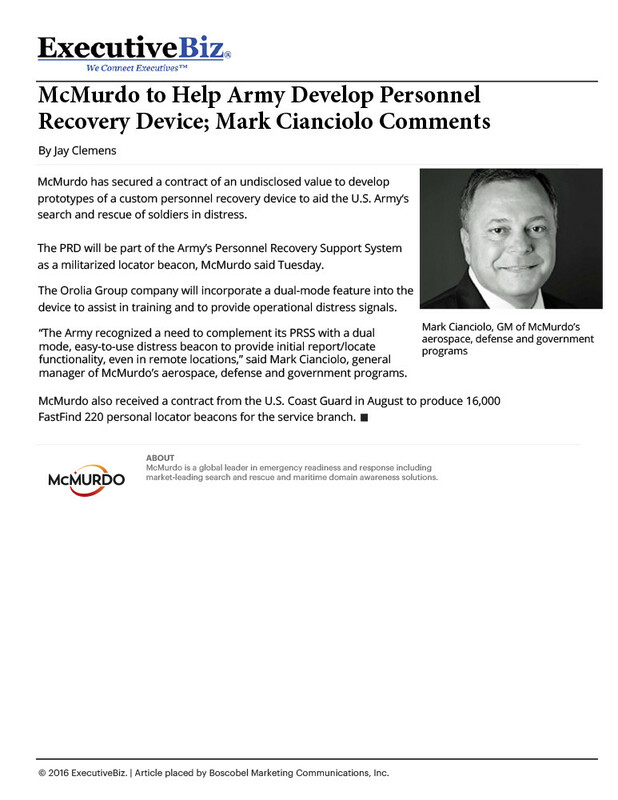 McMurdo Group, a division of Orolia, an emergency readiness and response products and solutions provider, has been supporting government agencies and military organizations around the world for more than 35 years. The company has manufactured more than 25 percent of the world’s 1.2 million registered emergency distress beacons. It has also built and installed nearly half of the world’s Medium Earth Orbit Search and Rescue (MEOSAR)-capable satellite ground stations. Yet McMurdo did not have the brand recognition it desired in the aerospace, defense and government sector. 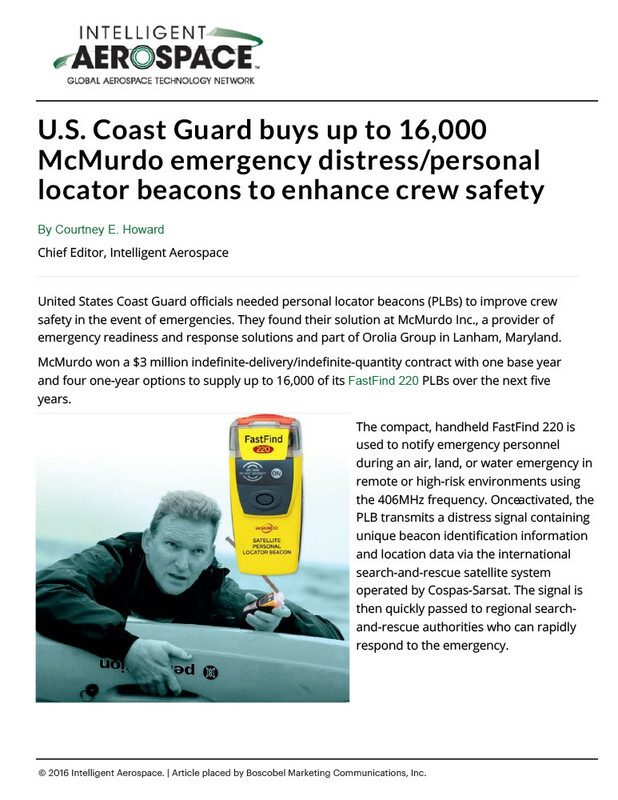 With satellite search and rescue (SAR) technology on the cusp of the biggest changes since the Cospas-Sarsat global SAR system became fully functional in the early 1980s, McMurdo executives recognized a need to promote the company’s accomplishments and capabilities to government and defense organizations. Our government and defense PR program for McMurdo was designed to deliver an integrated mix of news and milestones across the press, company website, industry events and social media. We wanted more customers to know about how McMurdo solutions help to prevent emergencies, protect government and military assets as well as save lives – more than 40,000 since 1982. In just the first four months, McMurdo appeared in more than 35 news articles – averaging more than two media hits each week! Senior leaders and other thought leaders at McMurdo appeared in aerospace, defense and government media outlets covering industry developments, contract wins and other company news. Washington Technology, Government Security News, National Defense, Intelligent Aerospace, Army Technology, Defense World, American Security Today and GPS World are just some of the publications that published McMurdo news. 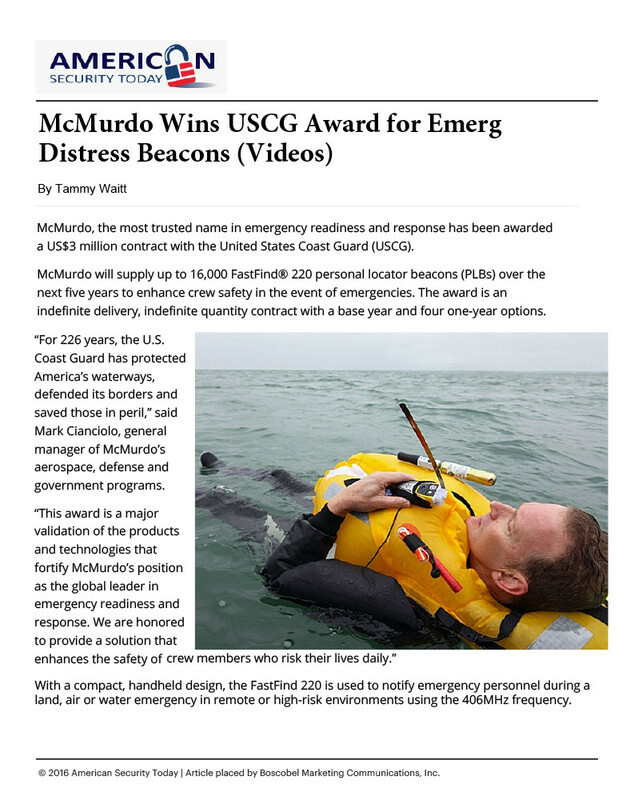 American Security Today also honored McMurdo with an ASTOR Homeland Security Award, recognizing the lifesaving value of company’s emergency distress beacons. Boscobel’s PR and Thought Leadership program for McMurdo reached nearly 5 million readers, the equivalent of more than $400,000 in advertising spend, for a fraction of the cost. Boscobel was successful in elevating McMurdo’s profile in the ADG sector as well as supporting the company’s business development efforts, as McMurdo hit milestone sales for its MEOSAR solutions at the end of our first four months together. 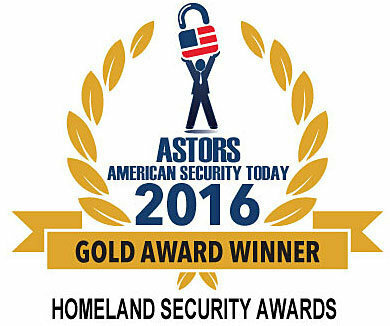 The work you and your team have done in the short time we’ve worked together has been outstanding in every regard! It is rare to find firms like Boscobel that are top-notch both in the quality of their work and the quality of the client relationship.